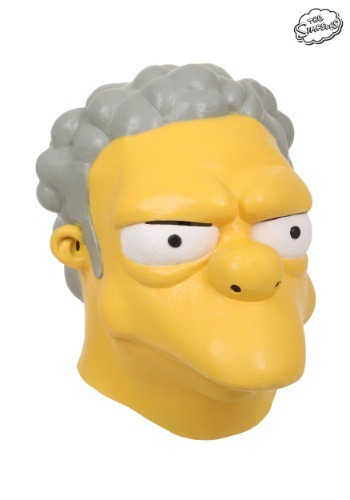 The Simpsons Moe Szyslak Mask By: Fun Costumes for the 2015 Costume season. Hopefully nobody out there has as... uhh, 'unique' of a mug as Moe. He's got his own harsh charms with his little cauliflower ears, severe overbite, and beady little eyes. He truly is unique, if that's how you want to put it. Therefore, you probably need a mask to become the famous bartender and inventor of the infamous Flaming Moe. This Moe mask will transform you into the Springfield barkeep. Unfortunately, bottles of Duff is not included... you'll have to get your own!